In grade five I won a public-speaking contest but the head teacher didn’t care for the topic I chose: chickens. “They were too,” she paused, curled her lip and shuddered as if she had just found a slug in her shoe, “chickeny.” I found her response amusing, for I had assumed that everyone would be fascinated by chickens. Wouldn’t anyone, given the opportunity, become completely absorbed by their clucks and coos, sleep-time murmurs, broody shrieks, curious personalities, and the dynamics of the pecking order? Because I’m the same person I was three decades ago, allow me to gush about chickens, why I adore them, and why I think they help round out a homestead. They are an essential part of the process of gaining more control over one’s food production. The eggs, with those bright orange yolks from happy chickens, are highly satisfying on many levels. The average chicken will lay about 260 eggs a year. Because we have different breeds, the egg shapes, sizes, and tones within our flock differ. With some accuracy, we can identify who laid which egg. Chicken manure is considered one of the most desirable organic fertilizers. It is very high in nitrogen, phosphorous and potash/potassium. As a result, it is very “hot” and needs to mellow for 6-12 months prior to using or it will burn your plants. An average hen produces approximately 1 cubic foot of manure every 6 months. Chickens are highly sociable birds. If they are out free-ranging and see us coming, they’ll clamber up the path with their barrel-chested run to greet us. When Lady Sussex needed to find a quiet place to lay, our rooster Tiny Tim followed her a respectful distance around their house, the two of them cooing softly back and forth. While she went inside the house and made herself a nest in the straw on the floor, he crouched on the other side of the hen house door, giving her privacy. Once the egg was laid, he joined her in the cacophony of clucking. I find it meditative to have chickens around the yard. One can slip into the zone and forget time, watching the birds work their way through the grass, gobble up bugs and worms and seek out the strips of sunlight in the yard. I love to watch them work through the compost pile. They jump up, pick through any edibles, and leave their deposits exactly where they belong! While they may have a pecking order amongst themselves, they are gentle creatures amidst the landscape. I will often see them free- ranging with the deer, both species aware of the other, comfortable in each other’s presence. 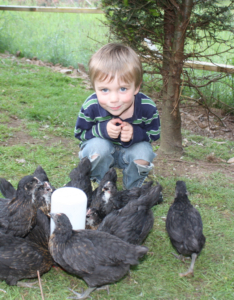 Galiano has a thriving community of passionate and knowledgeable chicken-keepers. Eyes light up when chicken-keepers talk about “their girls.” Before long, we’ve spent an hour discussing the breeds, their nuances, characteristics, and the latest antics that “the kids” are up to these days.